Birchwood Farms is a large country club and resort community located 3.6 miles north of Harbor Springs off of M-119. Spread across the 1,600-acre development are 27 holes of golf, heated pools, tennis courts, hundreds of homes and during the winter 8.5 kilometers of ski trails groomed for classic skiing. This is golf course skiing but the rolling nature of the terrain and the woods that surrounds much of the complex makes the skiing much more interesting than is normally associated with fairway trails. Plus the trails are well groomed by The Outfitter (www.outfitterharborsprings.com), an excellent outdoor shop in Harbor Springs that also rents out Nordic skis and snowshoes. 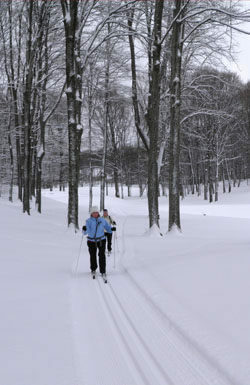 Birchwood Farms features three loops for cross country skiing as well as a trail designated for snowshoers. The trails are picked up from backside of the clubhouse where on the north side of Middle Road is the Blue Trail, a 3.7-km loop that is rated Intermediate. On the south side of Middle Road is the Gold Trail, a 3.2-km loop rated Easiest while departing from the Gold Trail is the Green Trail. 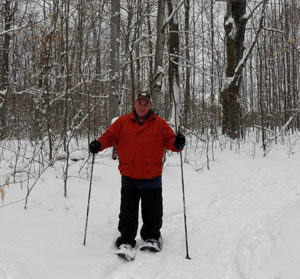 The Green Trail is 1.6-km loop, rated Advanced and by far the most interesting ski at Birchwood Farms. Keep in mind there is no warming shelter at Birchwood Farms for skiers nor drinking water. The trails are open to the public and there are no fees but skiers need to refrain from crossing residential lots to access the various loops. From the clubhouse, the Blue Trail heads north and immediately crosses Middle Road. On the other side the trail splits and either fork can be followed as there are no designated direction of travel at Birchwood Farms. If following the loop in a counter clockwise direction, the trail heads northeast and within a kilometer enters a pleasant stand of woods, where for the first time there’s not a house in sight. Two residential roads are crossed and 2 kilometers from the start you enter an open area of the golf course with several long downhills and climbs. None are steep but rather make for fun skiing especially if there is fresh snow. At this point the trail is heading south and at 3.2 kilometers arrives at a wooden, pedestrian bridge arching over Greenway Drive. Beyond the bridge you ski past more homes and then return to Middle Road where just on the other side is the clubhouse. The Gold Trail begins at the clubhouse and stays on the south side of Middle Road as it loops 3.2 kilometers through the front nines holes of the golf course at Birchwood Farms. This trail is very level and remains closer to the homes along the fairways than does the Blue Trail. If followed in a counter clockwise direction, you reach the marked junction with the Green Trail in 1.5 kilometers. The 1.6-kilometer Green Trail heads south where it crosses Greenbriar Road and enters a delightful forest of predominately white birch. The loop swings west and remains a level ski until it descends into a ravine, climbing out the other side before returning to Greenbriar Road. This downhill section gives the Green Trail an Advanced rating and makes it the most interesting ski at Birchwood Farms. 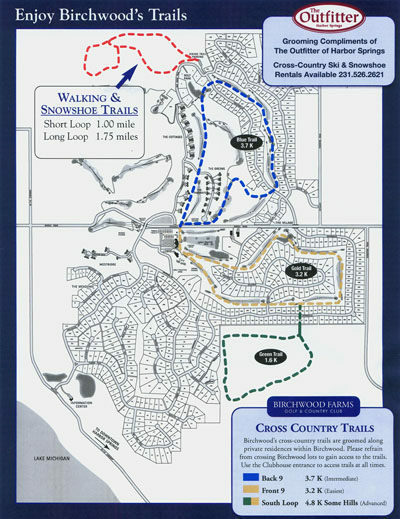 At the north end of Birchwood Farms are its Snowshoe Trails, a pair of interconnected loops that make for a 1-mile or a 1.75-mile trek. Both trails remain in the woods and the 1-mile loop is an easy walk with mild elevation gain. The longer loop departs from the 1-Mile Trail at a posted junction reached at 0.4 miles from the trailhead. It then descends almost 130 feet to bottom out near a small stream before climbing back out of the ravine and rejoining the short loop. There is no ski rental or warming facilities at Birchwood Farms. In Harbor Springs The Outfitter (231-526-2621; www.outfitterharborsprings.com) rents cross-country skis and snowshoes and is located at 153 E. Main Street. 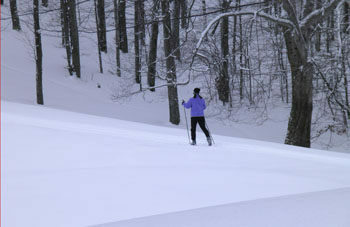 There are no trail fees to ski at Birchwood Farms. From US-31 in Petoskey head left on M-119 and head 6.9 miles to Harbor Springs. In downtown Harbor Springs turn right onto State Street and follow the route posted as M-119 as it heads north. The entrance of Birchwood Farms will be reached 3.6 miles north of Harbor Springs along M-119. For more information contact the Petoskey Area Visitors Bureau (231-348-2755, 800-845-2828; www.petoskeyarea.com).